Throughout 2017, we published a weekly blogging prompt for educators and edtech enthusiasts. We called this project — #EdublogsClub. 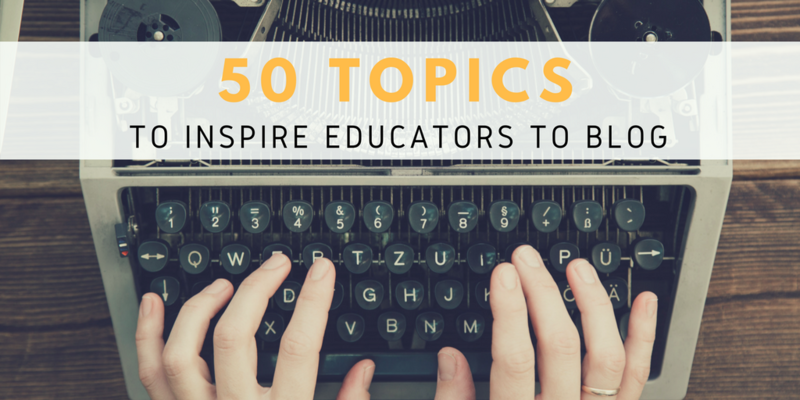 When the catch-up weeks were removed, we had a collection of 35 published blog post prompts. We have added these prompts, along with an additional 15, to create a new ebook of post ideas for educational bloggers. Bloggers who participated in the #EdublogsClub during 2017 might want to keep their blogging streak going by working on the additional 15 prompts (or pick and choose/catch up on missed prompts). Educators who are new to blogging, or have let their blog lapse, might use the prompts as inspiration to get going. Pre-service teachers might like to work through some blogging prompts as a way to begin their reflective journey as an educator, and start building a professional learning network. Retired teachers might use the prompts as a way to publish memories, reflections and wisdom around certain topics. You might consider getting a group of friends or colleagues together and forming your own #EdublogsClub. Each week, you could choose a topic to write about and encourage each other with comments and feedback. Note: you can find more elaboration, suggestions and examples in the PDF version. 9. Do you include popular culture in the classroom? 39. What could have been an alternative career for you? 49. Create your own list of prompts like this one! We would love you to comment on this post if you complete any of the prompts. The first 35 prompts in the ebook have a linked example to a post from an #EdublogsClub community member. The last 15 prompts don’t have examples. So we need your work! If you’re looking for blogging prompts for students, we also have a PDF resource with over 100 ideas! Spread the word about this resource and please get in touch with any feedback! These are such great ideas! Thanks for sharing, Alexandria! Hello, I made my first post a concert review which could be described as topic #36. However, I’ve come from a background in music so it’s more in my comfort zone! Blog post for #38 on goals: Looking Back @ Strategic Planning for a School Library Program. Great work, Barbara. I look forward to checking it out! Still getting inspiration from the Edublogs Club! Here’s my contribution for #37 What are your favorite blogs? Thanks Kathleen. You are my strongest supporter and I truly appreciate you. Super star! Your dedication has been extremely admirable. I’ve enjoyed all your posts. Thank you, Alicia. This is a big problem that will not solve itself, as you said! Thank you for offering your insights, Alicia. My love letter to my colleague https://readersbeadvised.wordpress.com/2017/12/06/10-things-i-love-about-her/ as the open letter. What a fantastic idea, Nina! Looking forward to checking out your posts. My next one will combine the next two! I left you a comment! I realized that the way the blogging was organized and when we started that it’s really more like a post and a half a week to finish out the year since we’re almost at the end of it, so you’ll see me finish it out by December 31st! I loved reading your thoughts and left you a comment, Alicia! Thank you for sharing, Alicia. I look forward to having a read soon! Thanks for the kind words Kathleen! My blood pressure is pretty high right now trying to figure all of this stuff out! For instance, where do I click to enable the RSS feed? Apparently, I’ve searched everywhere except the right spot! I understand. The learning curve can feel overwhelming but you will get there and you don’t need to learn everything at once. The good news is blogs automatically have RSS feeds and all modern feed readers are able to locate the RSS feed using the blog URL. Provided you have published a new post on your blog then someone adding your blog URL to a feed reader like Feedly would be able to subscribe to your blog. Let us know if you have more questions too. This is a great list for a beginner like me! I’m pretty intimidated by all of this right now, but my students appreciate my willingness to try new things. I usually end up learning as much from them as they do from me! I can see using blogging to reflect on activities our academic team does. What a fantastic attitude. Some teachers shy away from using online tools because they’re worried that their students know more than them. It’s wonderful to hear your students appreciate your willingness to try new things. Learning together is great. I love your comment about what teachers are worrying about. What a powerful post! I hope others take the time to read that. Such an important message. I’d love to include your example when we update the guide. I have left a comment on your blog too! Please feel free to use any post at any time. Thanks for reading. This is great news! I look forward to checking out your hobby post soon. This is exactly the inspiration I needed. Thanks! We’re very happy to hear that! Good luck and let us know how you go. This is good and I will be using it to blog for the next few weeks! Thank you very much Kathleen! I will translate them to my school too and I will send you a copy. I send tow English Versions to my colleagues who teach English to the older Students. My pace will be slow, as I my school is very long. Congratulations for your beautiful work.